A wave of "starguts" ejected into space from the supernova explosion of a massive dyingstar has been spotted by the Hubble Space Telescope. The newstudy, led by Kevin France, a research associate at the Center for Astrophysicsand Space Astronomy at the University of Colorado in Boulder, targeted theremnants of Supernova 1987A, which was first discovered in 1987. France andhis colleagues observed the interaction between the stellar explosion and thecircumstellar material around the former star ? forming what looks like a"string of pearls." A new video of SN1987A illustrates the odd formation. 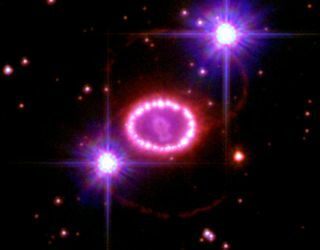 The glowingring of gas that measures 6 trillion miles (9.6 trillion km) in diameterencircles the supernova remnant and is energized by X-rays. These"pearls" of circumstellar material are made up of material that wasemitted before the star exploded, as it was preparing to die. The shockwaves from the supernova have been brightening some 30 to 40 pearls in thering. As the stellar debris interacts with the circumstellar material overtime, the pearls will eventually form a continuous glowing circle around theremnant. SN1987A isabout 150,000 light-years away from Earth on the outskirts of the Tarantula Nebula in the Large Magellanic Cloud, thenearest galaxy to our own Milky Way. The age ofthe original star that set off the explosion remains unclear, but is estimatedto be between 5 million and 10 million years. Analyzing supernovas is important because their intenseenergy may also trigger much larger cosmic interactions, and could beresponsible for regulating the physical state and long-term evolution ofgalaxies, France said. "In thebig picture, we are seeing the effect a supernova can have in the surroundinggalaxy, including how the energy deposited by these stellar explosions changesthe dynamics and chemistry of the environment," said he added. "Wecan use this new data to understand how supernova processes regulate theevolution of galaxies." The study isdetailed in the Sept. 2 issue of the journal Science.